This soup based on Knorr Vegetable Base contains many white "forgotten vegetables", such as Jerusalem artichokes, parsley roots and chervil root. Sauté the shallots together with the garlic in olive oil. Meanwhile, peel the vegetables, roughly chop, and add to the shallot mixture. Add the prepared Knorr® Ultimate Vegetable Base and prepared LeGoût® Soup Cream Base. Season with salt and pepper. Strain the soup in a blender. Cut the brioche bread into fine cubes and bake in butter until crisp. Pick a couple of nice leaves of watercress and blanch the rest in salted water. Purée the blanched watercress in a blender until smooth. Ladle the soup into the bowl. Drizzle with the watercress puree. Finish the soup with the watercress leaves and croutons. 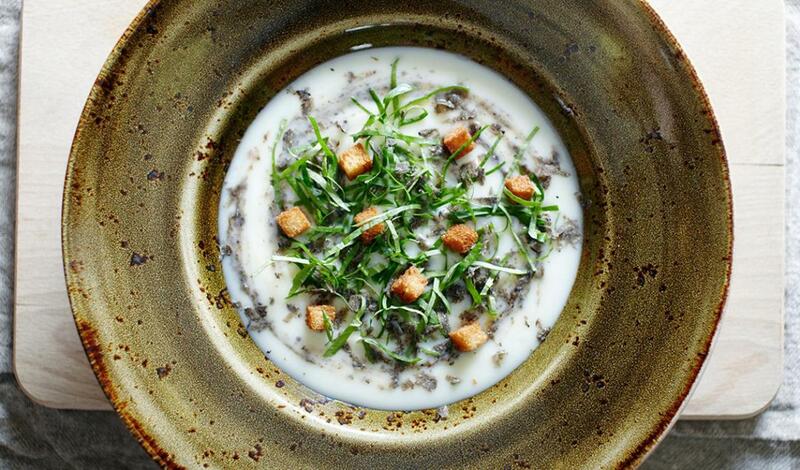 Garnish the soup with some freshly shaved truffle or truffle tapenade.